One analyst thinks Apple shares could reach almost $1,000 per share. Here's how. Updated from 9:52 a.m. EST to provide poll results in the thirteenth paragraph. NEW YORK ( TheStreet) -It's no shock to anyone that shares of Apple ( AAPL - Get Report) have performed exceptionally since the start of the year, but one analyst thinks shares may have more room to run: nearly 80% higher. Morgan Stanley analyst Katy Huberty raised her price target on Apple to $720, up from $515, as she raised her earnings estimates. What's really drawing attention, though, is Huberty's bull case. She believes Apple could go to $960 per share, nearly 80% higher than where shares are currently trading. Huberty believes that Apple could earn $80 per share in 2013, as new products continue to roll out to more markets. Apple recently announced the new version of its iPad, and many believe the consumer tech giant will refresh its iPhone line later this year. She thinks the smartphone and tablet markets will grow massively from here, and Apple is poised to take advantage of this trend in a significant way. The bull case sees the Cupertino, Calif.-based company generating $270 billion in revenue for 2013. In Apple's most recent quarter, its best ever, the gadget maker generated $46.33 billion in revenue. Assuming no growth, that $46.33 billion is annualized to $185 billion in revenue. Huberty's assumption's for another $85 billion more than that! The analyst believes that Apple could earn $80 per share, and the company's stock could hit $960, citing several reasons. These include capital expenditure spending, continued growth of the iPhone (129 million units in 2013), an average iPhone upgrade rate, even without new products or multiple expansion. The smartphone market is poised to continue its rapid growth, and Huberty sees it potentially hitting 1 billion units in 2013. Apple is projected to clinch approximately 26% of this market, as new carriers come online. The tech bellwether recently added China Telecom ( CHA - Get Report) to its list of carrier partners, and there is all the reason to think Apple will add China Mobile ( CHL, the world's largest mobile phone carrier, perhaps as soon as the next iPhone. "By expanding distribution to China Mobile, Apple can address another 120 million high-end subscribers, or the remaining 80% of the market," Huberty wrote in her research note. China has become increasingly important for Apple, and is now the company's second largest market, thanks to the country's accelerating growth. CEO Tim Cook said in October he has "never seen a country with as many people rising into the middle class that aspire to buy products that Apple makes." The Brazilian market is also important. "We see many similarities between the handset market and general demographics in China and Brazil, suggesting strong potential opportunity for the iPhone," Huberty wrote. She believes "Brazil can generate 2-3 million of iPhone unit demand in the near term and 2-3x that in the long term." This is not the first time an Apple price target approaching $1,000 has been mentioned. Co-founder Steve Wozniak believes Apple shares could approach that level, based on demand, and the fact that the company's offerings work so well together. "You know, people talk about $1,000 stock price ... you know, at first you want to doubt it but I actually believe that and I don't really follow stock markets," Wozniak said during an interview with CNBC. Wozniak is currently the chief data scientist at Fusion-IO ( FIO, which sells solid-state-drives (SSD) to Apple and Facebook, among others. Wozniak believes that all of Apple's products, (Mac and iOS devices) work so well together that it makes for an incredible customer experience, and the functionality Apple has provided is greater than anywhere else. "Apple is on such a winning course because it's encapsulated all of its different big products that I mentioned, they all work together so well that you are in a course that if you buy a product from another company it doesn't really do as much as one from Apple does. So Apple has a large room for growth," Wozniak went on to say. $960 per share would mean Apple pushing $1 trillion in market cap, a mind-blowing number. What's even more noteworthy is that as much as 20% of that value could potentially be in cash. Apple had $97.6 billion in cash at the end of 2011. The company's market cap was approximately 37% lower than where it stands today. Apple is growing at such leaps and bounds, a price approaching $1,000 per share seems almost inevitable, as long as the company continues to execute on its plan. 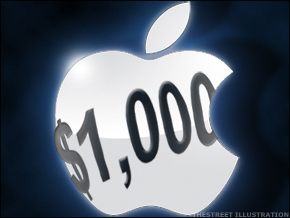 TheStreet polled readers, and nearly two-thirds of the more than 3400 respondents believe Apple will hit $1,000 per share within the next or three years. Only 2.7% of respondents believe Apple will see $1,000 in the next six months, and 8.5% of those who voted expected Apple would hit the mark sometime this year. One more thing (Steve Jobs reference) for Apple investors to consider. $960 per share doesn't take into account the oft-rumored Apple television set.